Hive work formally called Hive micro is very similar to other micro job sites out there. 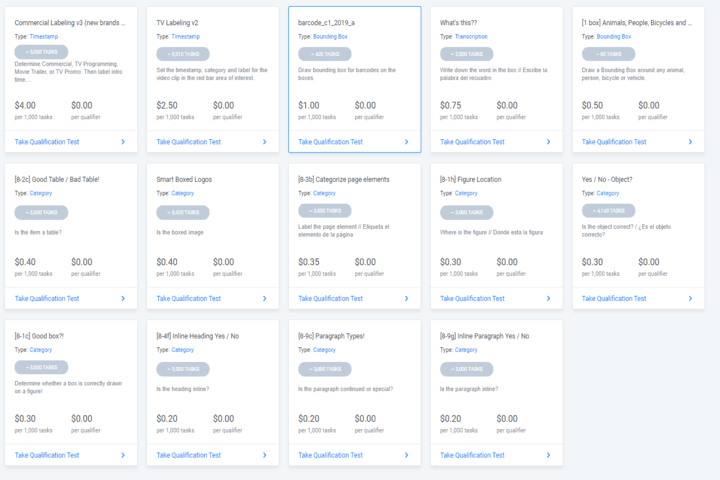 If you're familiar with GPT sites you may have done micro jobs on platforms like Crowdflower. Tasks vary greatly but in the end, all of them are mainly categorizing something in one way or another. Generally, speaking it would be fairly difficult to make a good wage doing this sort of work unless your very good at it and you live in a nation with a low cost of living. That said Hive Work tasks aren't very difficult once you look over the guidelines and pass your qualification test. The qualification tests are really part test and part tutorial. The pay for all the tasks is based on a rate of batches of 1000 completed. So for instance, if you complete 1000 Commercial Labeling v3 tasks you will make $4.00. This is the highest paying task I have seen so far. Most tasks pay less than 50 cents per 1000 completed as you can see from the image below. 1. The first step is going to hivemicro.com. They will ask for Email, Language, Country, and Full Name. It made me a little uncomfortable at first given them my full name for some reason. But the site is a legit site that has been around for a while. 2 years and 159 days to be exact at the time I am writing this guide. So it's not a scam site if you are worried about that. 2. After Signing up you will need to confirm your email. Now its time to get qualified for tasks. This step can not be skipped. Qualification tests are required before you can start earning cash for tasks. A tutorial on the guidelines of being packed into the test it's self. So don't be like me and be worried about even starting the test thinking I would not know what to do. Rest assured the test its self will teach you. Each test has a minimum amount of questions you are allowed to miss. For example, the Commercial Labeling V3 test has 19 questions. You must answer 14 of them correct in order to pass and start actually getting paid for them. So be careful and if you are having a difficult time with a question don't sweat it. Relax and look click on the "Instructions" tab to go back over what you are looking for. Some task can be a little confusing to get the hang of. When that's the case always review your instructions and think it over. Accuracy is key here. This is why your here right?! Now after passing your qualification test, you will now find that task listed under "My Jobs". The task will look the same as before only now you won't see the "Take Qualification test" link. Instead, you will see "Start Working". At this point, you are really all ready to go. After passing your test you should know what you're doing at this point. However, be very careful at first. Hive Work is very fickle about accuracy. They will ban you if your accuracy falls to low. This is probably the biggest complaint I have seen about them. So be very careful and make sure you are doing the tasks correctly. But of course, you will need to speed up in time in order to make any money with time. After all 1000 tasks are quite a bit for less than 1 dollar in most situations. Just be sure to get comfortable with the tasks before you raise the pace. Wow, this is really going to be up to you. They certainly have enough task available to make quite a bit of cash if your fast and accurate enough to do so. Some people make over 10 dollars a day. 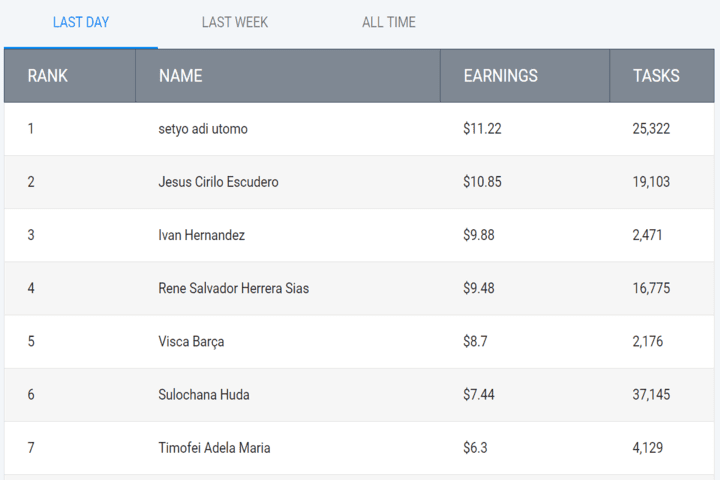 If you take a look at the screenshot of the leader board you will see a few works with over $10.00 in one day. Honestly, I think that would be quite difficult to do. Even with the higher paying tasks, this is going to take hours. Let's be honest here whoever "setyo adi utomo" is one thing is for sure he is a rock star and he knows it. Not everyone is going to be able to do that. But as we all can plainly see it is possible. How Will You Be Paid They pay workers via PayPal every Tuesday. The process is automatic based on if you reached you set minimum withdrawal limit. You can set it as low as $2.00. But most likely yours like yours truly will be set to $20.00 if you have not changed it. Most likely you will not reach $20.00 for a little while so you will probably want to change that to either $2.00 like I did or something lower than $20.00. Well unless you decide to be a rock star like "setyo adi utomo". 1. Near the top of the right sidebar, you will see a gray box that says Configure your PayPal account here. You guessed it you are going to want to click here. 2. Now you can move the slider from anywhere between $2 and $40. Once you have selected whatever amount you want click update payment settings at the button of the screen. Yeah, that tip is actually a famous quote from John Wooden. Never fully understood what John was talking about. But based on this quote he must have been familiar with Hive Work. In order to make this site remotely worth your time you will have to pick up the pace and start doing them quickly. However, don't be in a hurry to do so. Make sure you know what your doing first. If you get banned from a job its not going to matter how many you completed. So you work on jobs a few hours and you find out your not a rock star. Well, keep your chin up, my friend. You have one last hope. You can refer your friends and hope they are rock stars. You will earn $1.00 for ever $5.00 your referral makes. Your friend will also make an extra $0.50 as well so there is something in it for them as well. Sadly this is for the first 180 days after you referred them. And only on the first $25.00 they earned. So if you do the math you will get a max of $5.00 for you and $2.50 for your referral. Still, its free cash for you both of you. If you would like to know more about Hive Work check out the review we did a while back when the site was new and called Hive Micro. The information is a little dated but still useful. We also made a video review at the time which you can watch below. Let us know what you think of Hive Work in the comments below. Please feel free to share any additional tips or tricks we may have missed. 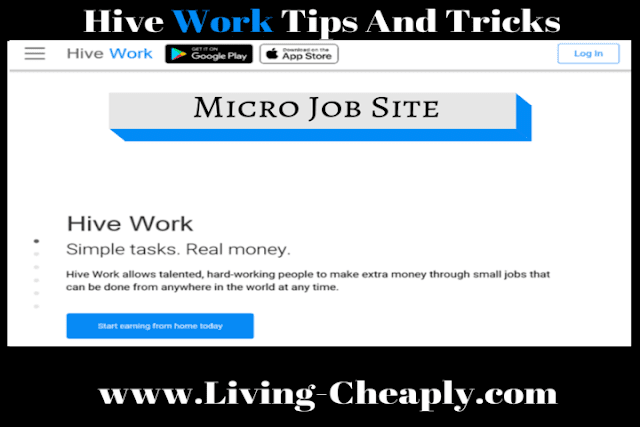 Is this micro job site, not your cup of tea? Don't lose hope one following gigs for making extra money may be a better fit you.